The Haycomp Emu is a compact electric walking and standing transfer hoist designed for aged care facilities and hospitals. It is designed to handle a maximum capacity of 175kg with electric lifting and leg opening control. 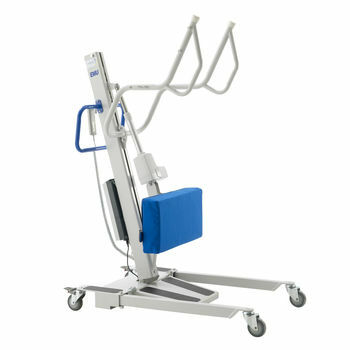 The Emu stander facilitates the transfer from bedside to chair, commode or toilet. It can be converted to a walker by pivoting the foot plate upward behind the knee pad, suitable for patients who are weight bearing and require minimal assistance. The addition of rehab arms convert the Emu into a rehab walker with full patient support. The Emu is supplied with a rechargeable battery and a separate charger as standard. A variety of sling options are available (dependent on attachment). Haycomp patient lifters are proudly made in Australia.